Think of self-publishing book marketing as a marathon, not a sprint. Plan the journey, prepare to work, pace yourself, and not become discouraged when you the bear jumps on your back. Your second wind is right around the corner. Unlike blockbuster books like Harry Potter, which sell 90% of their copies in the first 90 days of release, an independently published book is often the opposite – not surprising since titles like Harry Potter make up a percent of a percent of all books published. It takes time to build awareness. Sales may start slowly, but can climb over time if you persistently market your book. If you’ve yet to nail down a specific marketing plan, I suggest starting in your own hometown. Build a Tribe. Attract the interest and readers of people in your inner circle before you focus on your neighborhood. Then, focus on your neighborhood before concentrating on your city. Next your state and region, etc. This is known as the ripple effect. It applies to both online and traditional marketing tactics. “The history of the ripple effect, or butterfly effect,” writes Brian Bass of the Houston Chronicle, “precedes the modern forms of technology that today commonly utilize this phenomenon. The theory essentially represents the idea that what happens in one place at one time can have effects on another place at a later time.” According to Bass, when applied to the world of marketing, the ripple effect is taken to mean “subtly plac[ing] a brand or product front and center in the minds of consumers. A company can achieve this ripple effect through hype, dialog or opinions that the company creates about its products. The ripple effect of marketing states that this attention will generate more attention, benefiting the company.” The emphasis may be mine, but the words really do speak for themselves. Ripple effect marketing is marketing that builds on itself. But what about in the context of self-publishing? Our original post back in 2010 wasn’t far off when it proposed Harry Potter as an exercise in the exact opposite–particularly if we’re talking about the later books in the franchise, once the series had picked up steam. Nobody needed to generate interest in those books–the interest was already there, built-in, and marketing was simply a way to activate it. The ripple effect was completely unnecessary. The average self-publishing author–and the average midlist traditionally-published author, for that matter, if we’re being honest–needs the ripple effect because the average self-publishing author is starting from the ground up. With a limited budget, and a limited supply of time and energy to see them through. So why ripple effect marketing? Because its core principle is efficiency. You simply can’t find any other marketing theory that so effectively and efficiently makes use of what has gone before, and incorporates all of your individual strengths while pruning away marketing strategies that don’t work for you. As this BrightEdge diagram demonstrates, your marketing performance (that is, how many books you sell) is the direct product of the convergence between what you yourself create in terms of digital presence (“owned” media) and what you pay for others to create (“paid” media). The core content–your book–has a lot to do with your success, but so does your Search Engine Optimization (SEO), your finesse with social media, and your means of distribution (the diagram is referring to software, so its visual equivalent here is the Applied Program Interface, or “API”). The marketing process is simultaneously both linear and circular, with self-referencing feedback. And the key to making it work? Optimizing, optimizing, optimizing. Which essentially means backing up and posing the question “Is this helping? Why or why not? And how can I make it better?” at each and every step. The link address may seem only subtly different, but I promise you won’t regret taking the time to access the updated materials Google has compiled there, including recommendations for self-promotion, resources for authors and publishers, and a collection of success stories. (And let’s face it, we love tapping into the glow of success, if only to learn how others are finding ways to make it work.) And let’s not forget Google Play’s “Book Partners Center,” a separate (but linked) resource which provides step-by-step instructions on how to publish your book as an e-book in the Google Play store, and put your story on Android devices the world over. … remains 100% accurate. Google can help you do these things, but the ways and means have evolved in the last seven years––dramatically. I recommend glancing at Self Publishing Advisor’s primer on Search Engine Optimization (SEO); you can find the summary post and links to the individual posts here. Why? 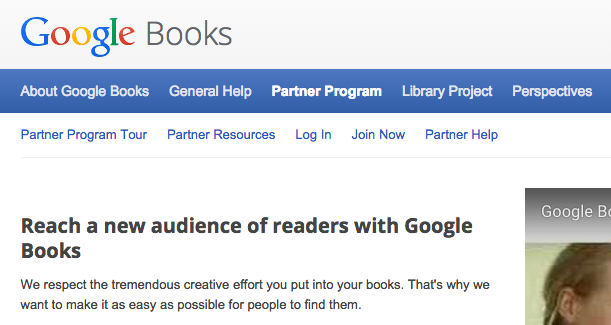 Because Google is a multi-platform tool now when it comes to self-publishing. Not only can you use Google Play to host and sell your book as a self-publishing platform, but you can use Google Analytics to analyze engagement on your personal webpage (or webpages), and you can optimize all of your web content across all of your different social media accounts and blogs and so on to better feed into your promotional campaign.